Cool. Calm. And oh, so calculated. 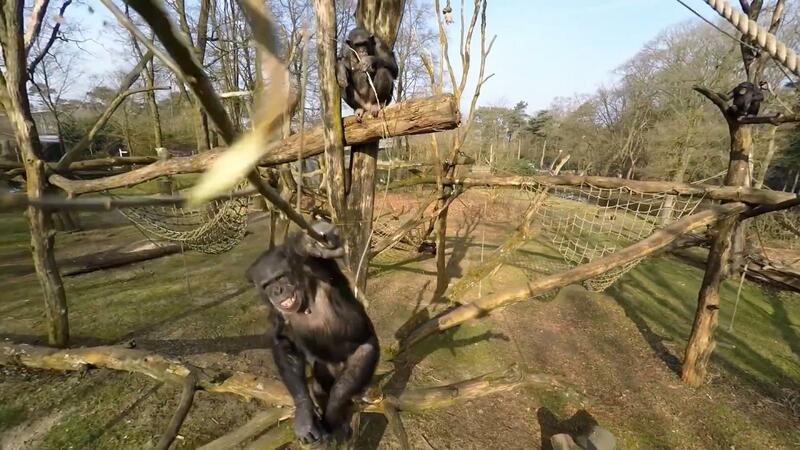 That's how a chimpanzee living in the Royal Burgers' Zoo in the Netherlands set out to swat an aerial drone that was filming her group. In an article in the journal Primates published by Springer, Jan van Hooff and Bas Lukkenaar explain it as yet another example of chimpanzees' make-do attitude to using whatever is on hand as tools. The incident happened earlier this year, on 10 April, when a Dutch television crew was filming at the zoo in Arnhem. The idea was to use a drone to film the chimpanzees in their compound from different close-up angles. The drone already caught the chimpanzees' attention during a practice run. Some grabbed willow twigs off the ground, while four animals took these along when they climbed up scaffolding where the drone was hovering. This behavior is not frequently observed among these chimps. Filming started when the next drone flew over. It zoomed in on two chimpanzees, the females Tushi and Raimee. They were still seated on the scaffolding holding on to twigs that were about 180 cm (ca. six feet) long. Tushi made two long sweeps with hers - the second was successful in downing the drone and ultimately broke it. Before and during the strike, she grimaced. Although her face was tense and her teeth were bared, she showed no signs of fear. This suggests that she quite deliberately and forcefully struck at the drone, rather than fearfully or reflexively. "The use of the stick as a weapon in this context was a unique action," comments van Hooff. "It seemed deliberate, given the decision to collect it and carry it to a place where the drone might be attacked." "This episode adds to the indications that chimpanzees engage in forward planning of tool-use acts," Lukkenaar says, explaining the broader significance of the filmed event. This incident also shows the apes cautiously inspecting the contraption and even throwing it around before they lose interest in it. According to van Hooff and Lukkenaar, the chimpanzees housed at the Royal Burgers Zoo have never explicitly been taught how to use different tools, but have had ample chance to watch humans handle all kinds of implements. Previous studies showed that the chimps at this Dutch zoo spontaneously and innovatively use up to 13 types of tools in a variety of ways, especially utilizing sticks of different sizes. The apes appear to choose the size, shape and weight of the tools with a particular use in mind. Sticks are, for instance, used to gather fresh leaves from overhead branches, while heavy pieces of wood and stones are chosen as throwing weapons.